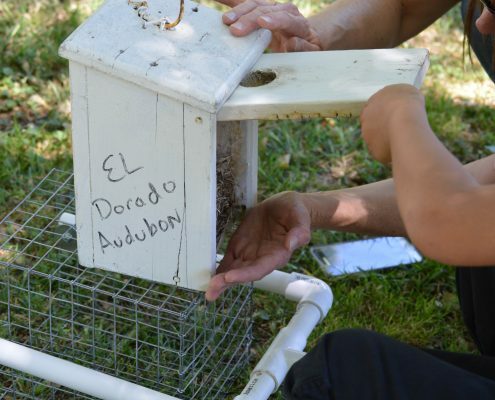 The mission of El Dorado Audubon Society is the conservation of native birds and their habitats. 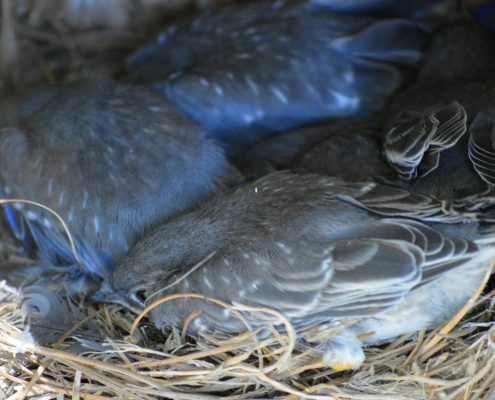 Our Chapter and members contribute in a number of ways, whether it’s providing much needed nesting places, creating habitat or supporting habitat restoration in local parks, open space, coastal areas or even in your own backyard. Citizen science, bird friendly communities and bird safe buildings are other ways we contribute to conservation of native birds. Due to loss of habitat, specifically cavities in dead trees, the Western Bluebird wouldn’t be very abundant in our area without a little help. Every year from February to July volunteers hang nest boxes in local parks and monitor the boxes during nesting season. Bird boxes are very good countermeasures for the lack of tree cavities for this cavity nesting species. Volunteers check boxes weekly, record numbers of eggs, hatchlings and fledglings produced in each box. At the end of the nesting season this data is submitted to the California Bluebird Recovery Program. Anyone can participate, if interested please contact us. A fun way to participate in conservation – get outside and watch birds, keep a list of the birds you see, take photos if possible and record your sightings in eBird. You can enter your bird lists in public locations called “Hot Spots” or you can enter your own location not publicly visible. The “Recent Sightings” widget shows birds seen in our area for the past 30 days and recorded under eBird public “Hot Spots”. We also use eBird to record birds seen on our monthly walks and surveys. Participants of a number of annual widespread bird count efforts also record their bird sightings in eBird. Examples: the Christmas Bird Count (CBC), Great Backyard Bird Count (GBBC), Global Big Day and Bird LA Day. Get outside, observe, count, record and enjoy the birds! Create natural food and habitat for birds in your own backyard. Native plants are not only a good food source for birds but many species are drought and bug tolerant. Check out the database to find which plants are best for your area and also see Audubon’s Plants for Birds page for more information. Important Bird Areas are an Audubon designation for the most important habit areas for birds. IBA’s are identified based on certain criteria, monitored and given high priority for protection efforts. We have a number of IBA’s within our Chapter territory, listed below, at some we conduct monthly field trips and bird surveys. 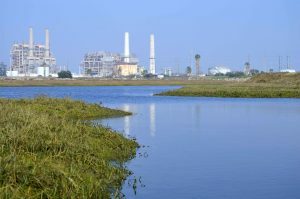 Los Cerritos Wetlands (LCW) is part of the Orange Coast IBA. This IBA has been described as a string of pearls along the coast. It includes LCW, Seal Beach National Wildlife Refuge, Bolsa Chica, Huntington Wetlands and Upper Newport Back Bay. Hellman Lowlands, 2nd Saturday, 8 to 10 a.m.
Zedler Marsh, 4th Sunday, afternoons, time vary, see our event calendar for details. 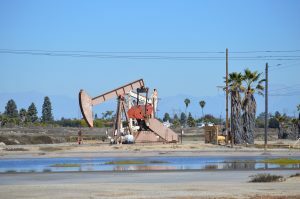 The restoration of Los Cerritos Wetlands is currently in the planning stages, which El Dorado Audubon is actively participating in the process. To learn about Los Cerritos Wetlands, watch the documentary, “The Lost Jewel of the Coast, Los Cerritos Wetlands”. The pristine marsh on North side of Synergy Oil property, at high tide. On the left, pristine marsh at low tide, on the right oil operations parallel to the marsh. Killdeer in the muted wetlands at Synergy Oil Field. Two separate EIRs are currently in process, one for the entire LCW complex developed from the Conceptual Restoration Plan or CRP (by the LCWA) and the other is proposed by private property owners (BOMP)–we encourage public comments and participation throughout this process. The LCW Conceptual Restoration Plan (CRP) has been in the works since 2011. This plan developed by Los Cerritos Wetlands Authority (LCWA) covers the entire LCW complex. As part of the beginning EIR process, the first public workshop was March 28, 2018. Please visit the LCWA EIR web page for workshop details and EIR information. You can make a difference for the resident and migratory birds and wildlife of Pacific Flyway. The bird species checklist is extensive — at least 120 species. 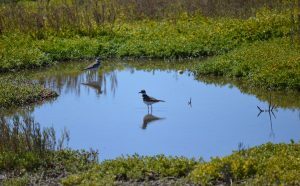 LCW is an Audubon Important Bird Area, a part of the “string of pearls” along our coast — which also includes SBNWR, Bolsa Chica, Huntington Wetlands, Banning Ranch and Upper Newport Back Bay. Please click here to read El Dorado Audubon’s letter to City of Long Beach regarding this EIR. This plan developed by BOMP covers the private property owned by Synergy Oil, currently an active oil field. On the North side of the property is the pristine 44 acre salt marsh. See the BOMP Restoration website for plan description. To read the BOMP EIR, see the City of Long Beach Planning Department website. The EIR was approved by City of Long Beach with conditions, but still needs review by many other permitting agencies. 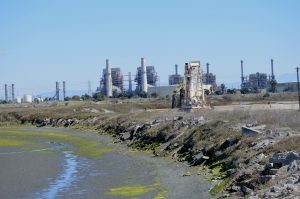 Next step is California Coastal Commission. Please also see BOMP project FAQ’s and Existing Conditions vs. Proposed Project whitepaper. This involves techniques for preventing bird strike casualties on glass windows. ABC and NY Audubon published an excellent paper explaining “how to” and the best tested methods which can be applied to either home or commercial buildings. Locally we encourage bird-friendly practices for any structure and for any proposed development projects.